What if Anna was the one with magic power? I recognized the Bouguereau reference immediately - the original is in my city, and it was always a favorite of mine, growing up! Aaaand there's the feet. Perfect for the internet . I really like Elsa and love Anna. Your art style is beautiful and has a natural professional oil painting feel despite it being digital. The style also fits the characters and the surroundings well. I love Anna personalty and traits of optimism, fun, adorkable, and feistyness. I enjoy seeing works and fiction with Anna having powers. Many give Anna fire and association with Summer due to the opposite nature of Ice and Winter which Elsa represents and controls/embodies due also how their personalities differ yet round each other out. But many also associated Anna with Spring out of all the seasons (especially if Merida/Fall and Rapunzel/Summer is included) as well and Anna favorite color is green and wears something green throughout the film on her outfits plus the joys and embodiment of life she portrays. Thus Spring is Plant/earth/flower related as majority of plantlife bloom in that season. Though there are certain flowers and plants that bloom in the other seasons such as the Arendelle's crest the flower named Crocus. The Crocus is a symbol of rebirth and spring. In cold regions, the flower blooms while snow is still on the ground). Perhaps like in the movie Anna had fun playing with her big sister Elsa growing big and funny looking trees they would climb on, wooden slides, and wide fields that from the sky one can see colorful works of nature art. On day was enjoying a chocolate picnic made with cocco nuts from Anna on top tree Anna grew under them and looking at the beautiful colorful flower garden kingdom, hedge animal creations and mazes, Strawman, and nature Anna made below all for Elsa. Elsa however slipped off the branch and Anna frightened tried to create a plant to catch her softly but hit Elsa instead in the eye. Elsa landed with a thud and didn't awaken but moaned alot. From the eye a small plant grew and slowly rots began to creep under Elsa's skin. Anna horrified called out to their parents while clutching Elsa. Elsa was taken to some mysterious trolls whom was able to save her from death but not the eye. Elsa's memories was taken away so she would not remember the pain or the event as the parents feared it could traumatizes her and have her fear the sister. But Anna remembered and the fear and guilt took a toll on her mind and powers. Roses thorns grew large and sharp, fields withered and produced uneatable fruit and vegetables, animals couldn't find fields to eat, and plantlife became unpredictable and thorn bushes, damaging trees, and vines grew large. Anna for the safety of herself and others was placed in a newly built tower far from the earth below and others. Anna was given many things to play with and special tutors and servants to assist only her but had to stay in the tower high above at all times intill she was able to control her powers. As she grew so did her powers. Looking down at the kingdom watching life and joy go on below she longed to return to the people and earth but feared it at the same time. She feared most of all to hurt her beloved sister again the heir to the throne. Elsa however didn't know what became of Anna nor recall her powers. When asked she was told Anna had developed a grave illness and was put into special care for protection. 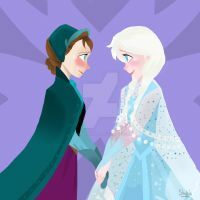 Elsa could only talk to Anna by messages hoping she would get well soon while Anna responded with words and pictures of art that she practiced and became natural during her time in her tower and watch Elsa secretly from above. Anna furthered did anything to entertain herself and passing the time such as talking to her favorite paintings that was moved to her tower particularly Joan. The parents understanding it was Anna's emotional turmoil that was causing the magical problems and the situation wasn't advancing to where they had hoped for the daughters made "special" metallic gloves and boots telling her that they were magical and would block her magic. As extra precautions a wheelchair was also made for Anna so her body would never fully touched the earth. Anna believed her parents using the gloves and boots like a magical crutch never wanting to take them off nor go anywhere outside without the chair dispute able to run marathons secretly in the castle but was antsy to go out once more. On the day Elsa was to become Queen Anna the new heir was royally obligated to present Elsa with three symbols of Arendelle and the royal family during the coronation. Elsa was posed but underneath was thrilled to see and be by her sister again. Anna had mixed feelings as for the first time in forever she would be part of something and apart of the life, fun, and celebrations the kingdom held and be there at her sister side during her special day but her natural exuberance was tempered as it also meant removing her gloves during the coronation to present the scepter, orb, and the flower Crocus to Elsa. Hey. thank you for this comment! Actually I was thinking Anna as a kind, joyfull and open-hearted person would easily figure out that love is the way to control her powers, but then the whole plot and drama would be gone And I love the idea of Flower Palace and her flower dress^^ Beautiful story! I agree with Anna being a kind, joyful and open-hearted person thus unlike Elsa the parents feel comfortable letting Anna out due to her nature and the fact Anna believes her parents being a trusting and loving child when she receives her special metal gloves, boots, and wheelchair. However Elsa' like Anna and her hair having white Elsa I feel hit in the eye would have a eye-patch (with the Crocus emblem on it being the crest of Arendelle) and when Anna looks at her sister's face it will be a constant reminder of that day and of how powerful and dangerous her powers are and that would raise Anna's guilt. Trying to be responsible and ensuring her sister isn't hurt again Anna goes to the extremes (Anna is smart but often does act before she thinks). Plus love is powerful but can directed to a different vision of fear vs one of freedom and open expression. Anna loves her sister, parents, the servants, the guards, the people of Arendelle. BUT inside she has self issues and a feeling of worthlessness (something actually in the film and talked about but the directors). That can cause Anna to question why even she was born with powers and not her sister "who be truly worthy and already special and responsible" believing the universe higher powers made a mistake. Her love for others but not herself can empower feelings of fear though want of protection for them (like Elsa did). Love is powerful but what does it direct you to see and do? Fear itself is also a double edge sword. While negative it's also a positive and necessary for humans. Fear can allow us senses of danger and heighten our reaction to prepare for it or avoid which is sometimes the answer but for the movie wasn't the true case. Both Elsa in the movie and Anna here needs fear just like a sword or gun welder should fear their weapon to ensure safety for others. Not underestimated the power the characters create a strict and healthy scene of caution and moral rules for themselves. 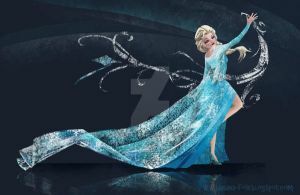 However to much fear empowered by her love but not focused on that and no conference left Elsa in a state of depression and self hate and Anna too can also feel that way while still being extroverted mostly. This in this case Fear overpowers love plus was supported by it causing negative results. Fear is a necessary trait but love of both outside and in must overpower it and the positives and warmth of love being the focus. Anna's natural exuberance and optimism but yet her own internal self hate as well could also affect the plant life thus Anna has to reel herself in and that can be tiring not always being true to one self and putting on the mask draining her internally. I'm also thinking like Elsa creating life the plants are alive with the limbs moving and reacting to the feelings of Anna. The plants giving her other abilities she never knew she had (example such as entering into a large plant enclosing around her and though the roots/vines of the plant life that interconnects transports instantly from one plant to another large plant that she exits). But funny that I a strange feeling about the composition, it's been cropped too close on the sides or something, and I get that feeling on the old master's painting too . Well she would have been substantially more compelling. Though I must wonder if their parents would find some reason to coop her up in her room for several years...? Flooding and creating scarecrows which can kill people.